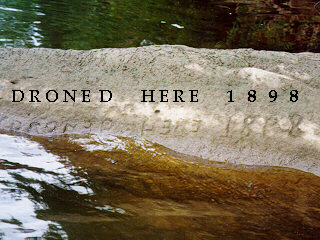 James Law Was Drowned Here, 1898. Records from Freeport Cemetery show that James Law was drowned in the Allegheny River in Allegheny County on March 31, 1898 and was interred in a section of the cemetery known as the "Strangers' Ground." It's possible that the boy was not a native of the area; he may have been a passenger on a boat traveling on or across the river. However the name of Law, and specifically that of James Law, had been recorded in census and property records for the South Buffalo area since at least 1831. A census report from the latter nineteenth century records a James Law living in Manor Township, some twenty miles above Freeport. One might reasonably conclude that one or both of these men were progenitors of the unfortunate boy. Further conjecture suggests, as the boy was drowned on March 31st and was not interred until April 26th, that his body remained unrecovered for that time. Perhaps his family lived a distance from Freeport and made a fateful visit to that town during which James drowned in the river. With no body to bury, the family had to content themselves with carving the boy's name on the rock near the place of his death before returning home. Some weeks later when the body was recovered, it's condition may have required an immediate burial before the family could be reached in regard to their wishes, and so James Law came to rest in the "Strangers' Ground." This map shows the location of the rock, about a mile below Freeport, PA. 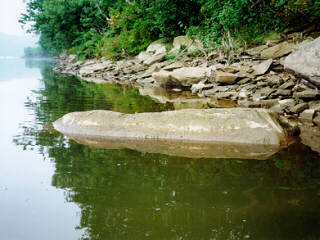 When this legend was carved, thirty years before the damming of the river, this rock would have stood on dry land near the bank of the Allegheny. Today, most of the inscription lies beneath the surface of the water. It reads, "JAMES LAW WAS DRONED HERE 1898 10 YEARS OLD." The letter 'E' is reveresed throughout the inscription and the number 9 in the date is also written backwards.